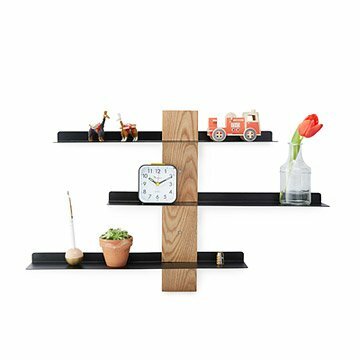 This clever sliding shelf system can be configured for any creative display. Designed for flexibility, this clever shelf system can be configured for any creative display. Thanks to grooves hidden in the ash veneer plywood base, the three metal shelves can slide freely side to side for versatile display options: Shift upper shelves to allow tall items to sit below, or adjust them to accommodate oddly shaped wall areas. It's sized just right to hold kitchen spices, showcase favorite photos, or display small framed art and cherished collectibles. Installation hardware (included) is concealed behind brushed metal caps. Designed by Gwen Weinberg; Made in China. Gwen Weinberg exhibited the potential of a career in industrial design from a very young age, much preferring scissors, construction paper and glue to all other toys. Born in Philadelphia and now living in Seattle, Washington and Lisbon, Portugal, Gwen received informal training in art and design at a few universities on both US coasts. She now considers it a gift for her own design vision to have not been boxed into one formal sensibility in her training; from the start of her career, beginning as a jeweler, metalsmith and bookbinder, Gwen’s designs have always gone beyond the obvious, standard solution, from her innovative use of materials, to her unexpected proportions, to her concepts that forge entirely new product categories. Currently, Gwen is happy to be re-focusing on paper goods, returning not only to her early design years' bookbinding roots, but going all the way back to one of her earliest childhood pleasures. Wipe surface with a clean dry cloth. Apply a small amount of water or rubbing alcohol to cloth for deeper cleaning, if necessary. Holds approximately 15 lbs. Instructions and installation hardware included.